From the highly acclaimed, bestselling National Book Award finalist and author of A Short History of Women, a searing and timely novel about a teenaged girl, a charismatic teacher, and a dark, open secret. They were on a lark, three teenage girls speeding across the greens at night on a "borrowed" golf cart, drunk. The cart crashes and one of the girls lands violently in the rough, killed instantly. The driver, Jo, flees the hometown that has turned against her and enrolls at a prestigious boarding school. Her past weighs on her. She is responsible for the death of her best friend. She has tipped her parents' rocky marriage into demise. She is ready to begin again, far away from the accident. Taut, propulsive, and devastating, His Favorites reveals the interior life of a young woman determined to navigate the treachery in a new world. Told from her perspective many years later, the story cooly describes a series of shattering events and the system that failed to protect her. 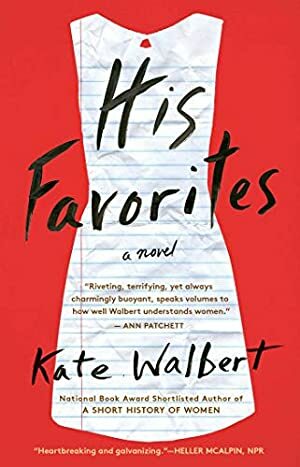 Walbert, who brilliantly explored a century of women's struggles for rights and recognition in her award-winning A Short History of Women, limns the all-too-common violations of vulnerability and aspiration in the lives of young women in this suspenseful short novel. From the publisher of the classic A Separate Peace, His Favorites is an urgent book by a "wickedly smart writer" (The New York Times Book Review) whose work is "fascinating, moving and significant" (The Washington Post). Log In to track Kate Walbert on eReaderIQ. to be notified each time the price drops on any book by Kate Walbert. to stop tracking Kate Walbert. We started tracking this book on January 10, 2016. The price of this book has changed 3 times in the past 1,198 days. The current price of this book is $10.99 last checked 16 hours ago. The lowest price to date was $2.99 last reached on March 25, 2019. The highest price to date was $12.99 last reached on January 10, 2016. This book has been $12.99 one time since we started tracking it. We last verified the price of this book about 16 hours ago. At that time, the price was $10.99. This price is subject to change. The price displayed on the Amazon.com website at the time of purchase is the price you will pay for this book. Please confirm the price before making any purchases.